Rosalind, a tomboy and student of the occult, returns home from training to find that the story of her parentage is a lie. Her adopted father begs her to not seek her biological parent, a dangerous man named Thomas Hughes. Distressed, but vowing to obey her father-not-father’s wishes, she returns to her tutor in search of answers. The art, however, is stunning. 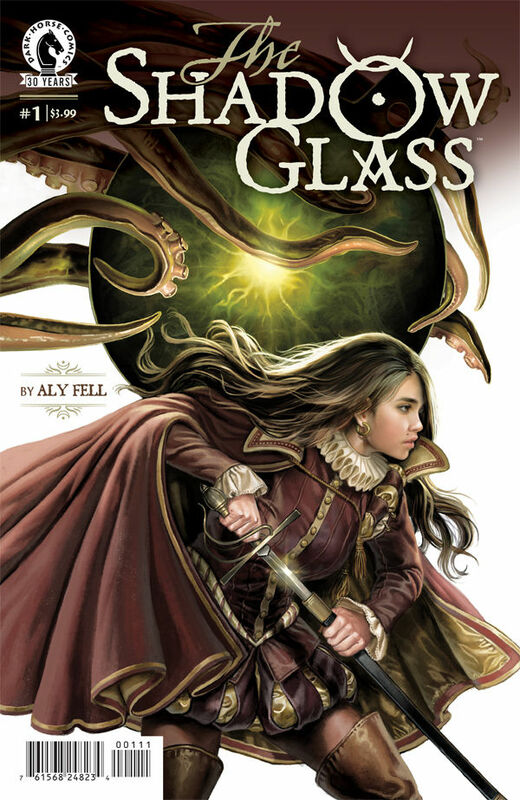 Fell does a fantastic job of bringing her world to life with characters and magic that jump off the page. The amount of skill put into crafting each frame is staggering and you’ll find yourself lingering on the pages longer than normal, just to take in the amount of detail. Despite the first issue’s hackneyed plot, Rosalind herself is an interesting character. She’s an arrogant young woman who refuses to wear woman’s clothing, trains with a sword, and prides herself on her own strength. Yet, near the end of the issue, she throws herself at her tutor’s feet in a fit of tears, begging he answer her questions. It’s unclear whether her bravado is a front, or if she’s simply contrary – either way it will be interesting to see her grow. The Shadow Glass #1 hits shelves on March 23. The story may yet kick into gear, but at the very least it’ll be one of the most gorgeous books on the stands. Pick it up from your local comic book retailer, or pre-order from Dark Horse directly.